Firstly, is the following sentence correct? My brother is being unusually nervous lately. If correct, how is being nervous behavior? We usually use the progressive of be to describe a behavior or an action, not states of the mind. Secondly, I have read in both Longman and the Oxford dictionary that you use only present perfect with lately. The attachment below is from Practical English Usage written by Michael Swan. "Being nervous" means acting nervously. This is the same with all your other examples as well. You're being stupid does not really mean at the present you are lacking intelligence. It means at the present you're demonstrating a lack of intelligence or, in other words, you're acting stupidly. Likewise, I was being very careful has the same meaning as I was acting carefully. Who's being a silly baby: again, the accusation is not about the state of the person, it's a commentary on their behavior (they're acting like a silly baby). The point about using the present perfect with lately is completely separate. But briefly, what you've read is correct. The sentence should be more like: My brother has been being nervous lately. "Been being" doesn't sound nice, so we'd probably say, my brother has been acting nervously lately. 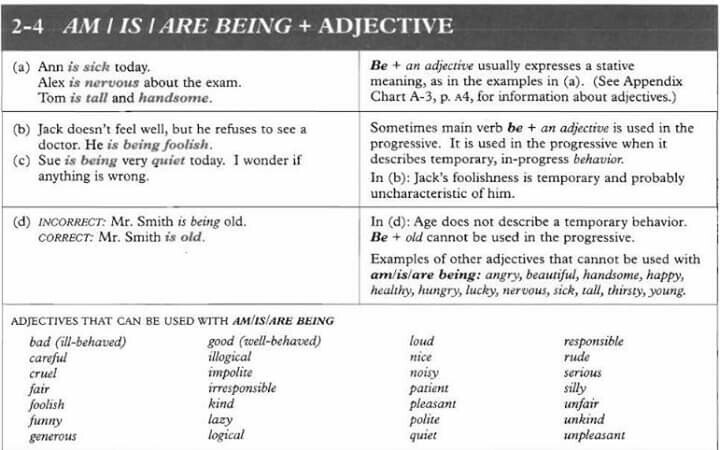 It seems to me that the adjectives that describe some character can denote behavior in this structure (being + adjective), not those which describe states. Not the answer you're looking for? Browse other questions tagged grammar word-usage tenses or ask your own question. Is the tense called “Present Progressive” or “Present Continuous”? Aspect (simple, perfect and progressive): What are the differences?